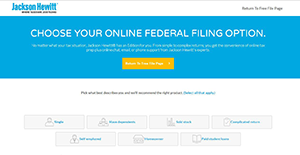 Jackson Hewitt online tax software provides an easy, fast, and accurate way to file returns. Regardless of your tax situation, the platform provides the most appropriate solution for you. Whether it’s a simple or complex return, Jackson Hewitt provides the convenience of tax preparation plus expert support via phone, email, and online chat. The online tax program is simple, secure, and it guarantees a maximum refund. Besides, the platform guarantees accurate calculations and will take responsibility in case any of the calculations done by the software is inaccurate, and it leads to penalties levied by the IRS. However, the company will not assume responsibility if the taxpayer provides incorrect information. Another noteworthy benefit is the ease of use exhibited by the software. It is fairly straightforward to navigate different aspects of your return, and when mistakes happen, it’s easy to fix them. There is a detailed wizard that guides you through your whole income and deduction representation. In addition, it automatically creates a return featuring all your required documents. The platform provides key features including; import W-2 forms automatically, student loan interest, dependents (including), interest or income interest, mortgage interest $ property tax, investments (retirement, bonds, and stocks), deductions and self-employment income, maximized deduction, and dependent including EIC. If you are interested in Jackson Hewitt it could also be sensible to investigate other subcategories of Best Tax Software gathered in our database of SaaS software reviews. Each enterprise has different needs and requires an application that can be customized for their size, kind of employees and customers, and the specific industry they are in. For these reasons, no software can proffer perfect features off-the-shelf. When you search a software app, first be sure what you want it for. Read some Jackson Hewitt reviews and ask yourself do you desire basic tools or do you want complex features? Are there any industry-specific features that you are searching for? Obtain the answers to these queries to help your search. There are multiple factors that you need to mull over and these include your finances, particular business requirements, your organization size, integration requirements etc. Take your time, use a few free trials, and finally choose the system that offers all that you need to enhance your company efficiency and productivity. How Much Does Jackson Hewitt Cost? We realize that when you make a decision to buy Tax Software it’s important not only to see how experts evaluate it in their reviews, but also to find out if the real people and companies that buy it are actually satisfied with the product. That’s why we’ve created our behavior-based Customer Satisfaction Algorithm™ that gathers customer reviews, comments and Jackson Hewitt reviews across a wide range of social media sites. The data is then presented in an easy to digest form showing how many people had positive and negative experience with Jackson Hewitt. With that information at hand you should be equipped to make an informed buying decision that you won’t regret. What are Jackson Hewitt pricing details? What integrations are available for Jackson Hewitt? If you need more information about Jackson Hewitt or you simply have a question let us know what you need and we’ll forward your request directly to the vendor.